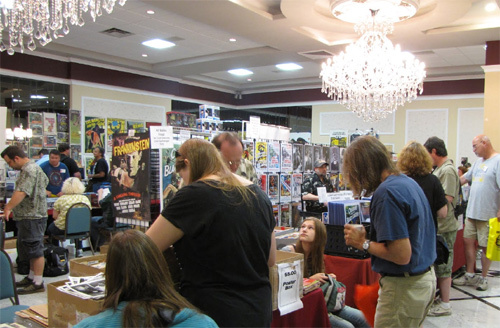 The Monster Bash 2012 featured Guests of Honor Martine Beswicke, Richard Kiel, Arch Hall Jr., Bert I. Gordon, Jimmy Hunt, Tom Savini, John Russo, George Kosana, Kyra Schon, Cortlandt Hull, Chilly Billy Cardille, David "The Rock Nelson," Son of Ghoul, Count Gor De Vol, Mr. Lobo, Penny Dreadful and many others! Photos provided by Arch Hall Jr., Malcolm Gittins, Evan Kendal, Brian Kegan, Ted Lewczyk, John Sargent, Charles Henson and others - thank you! 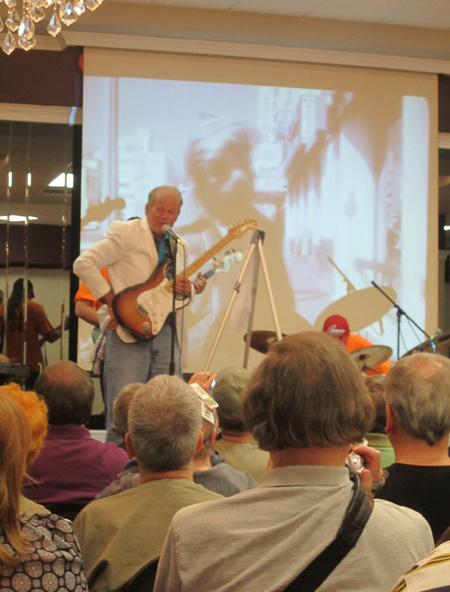 Arch Hall Jr. wows the audience with his guitar work and singing on Saturday Night with the Monster Bash house band - The Bash Boys. 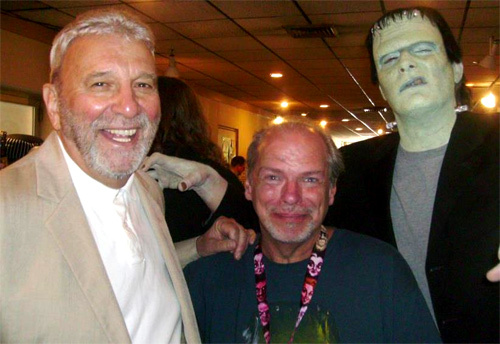 Malcolm Gittins (center) with two icons...."Chilly Billy" Cardille and the Frankenstein Monster (Todd Spidle, make-up by Reel Magic). 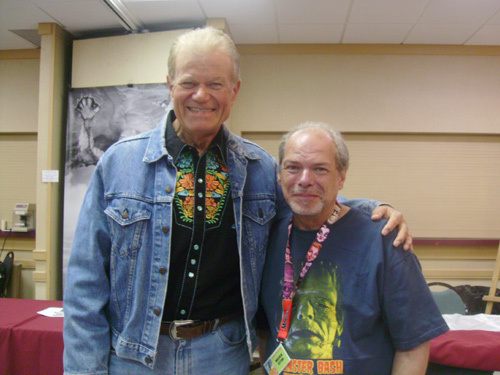 Arh Hall Jr. and Malcolm Gittins are smiles and 1960s rock 'n' roll at the Bash! 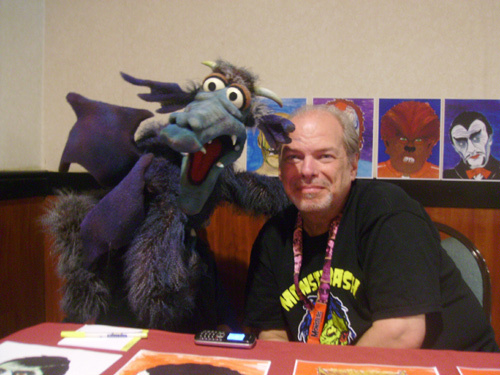 Gorgo, Bill Diamond's star of MONSTER TV, hangs out with Malcolm Gittins. 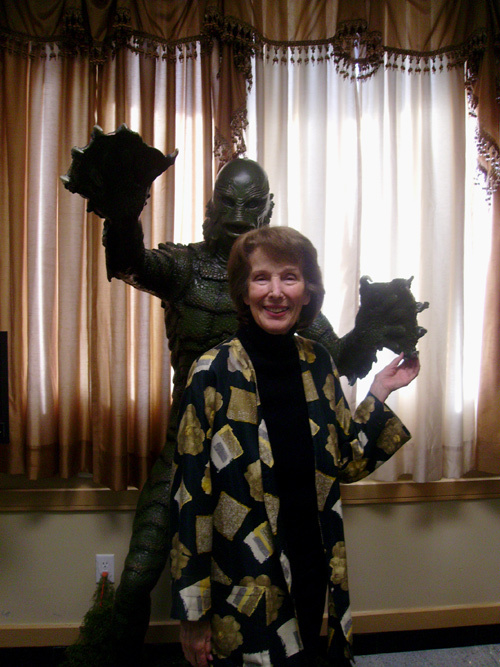 Julie Adams meets an old friend at Monster Bash! 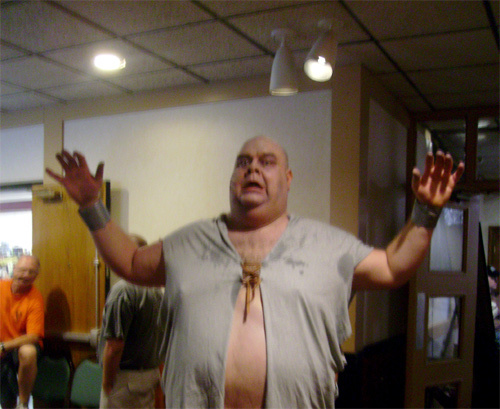 Tor Johnson lives! It's Kevin Rice...."Time for go to BASH!" Friday night Mexican night at Bash...a recreation of the Mexican SANTA CLAUS movie where Santa meets a devil....add one Santito to bring peace to the madness! 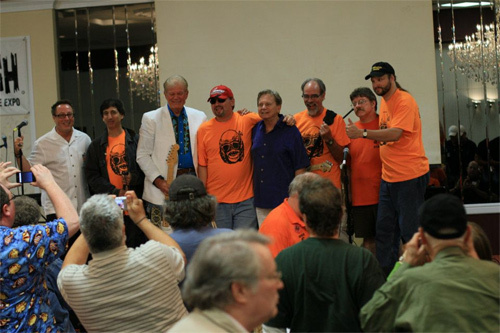 After performning on stage Friday evening - The Bash Boys (Monster Bash house band) and their special guests. 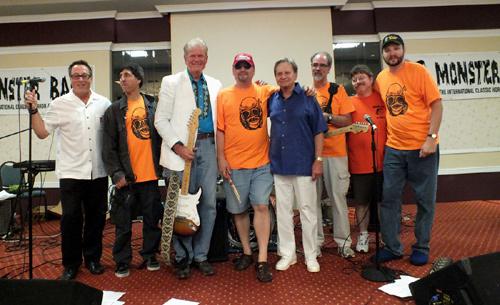 Left to right: Mark Statler (special guest), Steve Unger (keyboards), Arch Hall Jr. (special guest, wild guitarist), Bob Pellegrino (drums), Kenny Miller (special guest), Kevon Slick (guitar), Shawn Isreal (tamborine) and Dan Weber (bass). 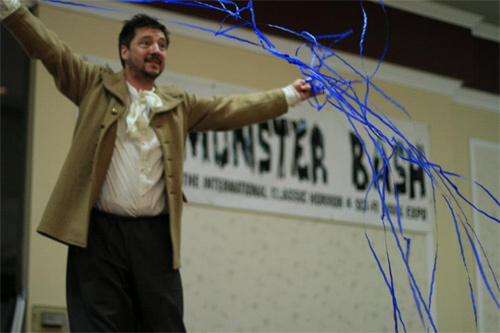 Live theater Saturday night with Zach Zito as he took a road traveled by Sir Arthur Conan Doyle to find....dinosaurs! 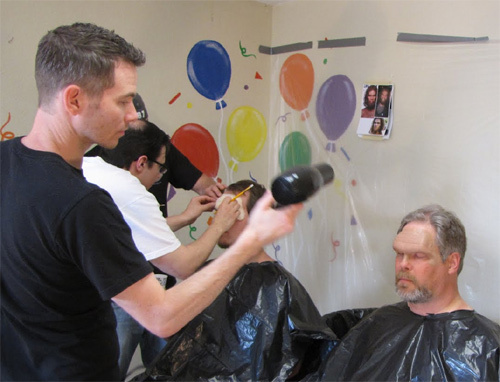 Ted Lewczyk begins his Saturday at Monster Bash in make-up with John, part oft he Reel Magik make-up team. Cavemen production line for the "Prehistoric" Monster Bash. 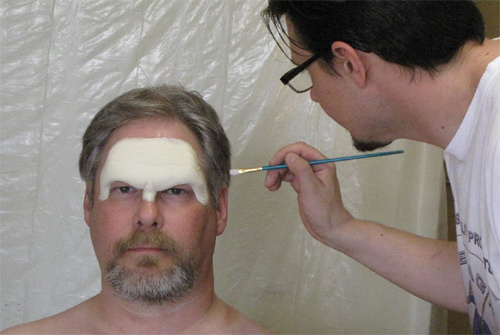 Chief make-up man Jesse Melchior on left. 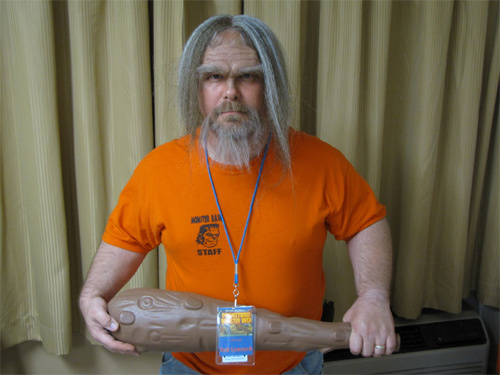 Caveman Ted Lewczyk gets ready for Monster Bash security duty. 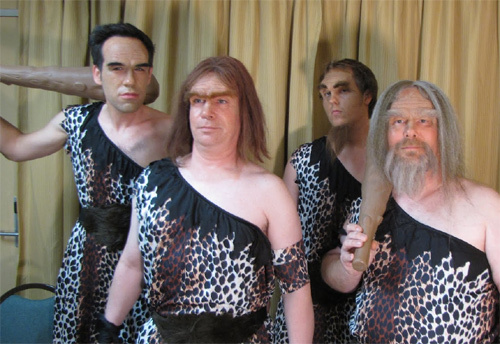 The caveman team....L to R: Thom Shubila,Charlie Arrigo, Connor Whelan and Ted Lewczyk. 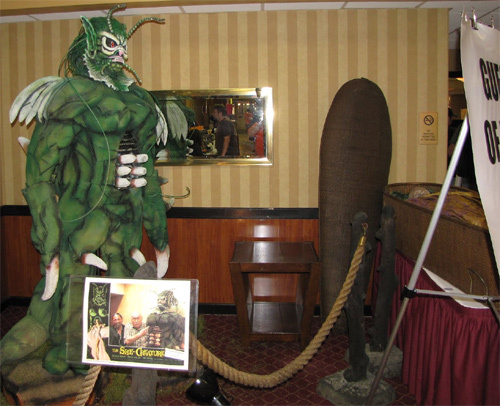 A homey little corner in the Monster Bash lobby with Bill Diamond's 8 foot She-Creature! 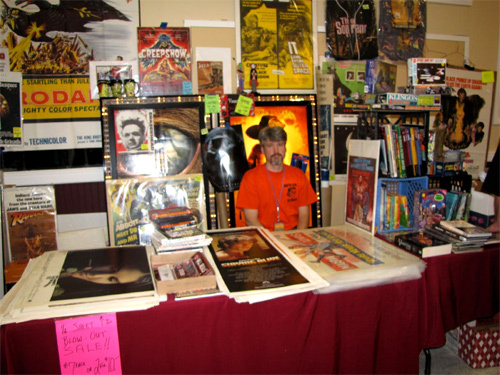 Jon Doerr of Hollywood Hounds display original movoe posters at Bash. 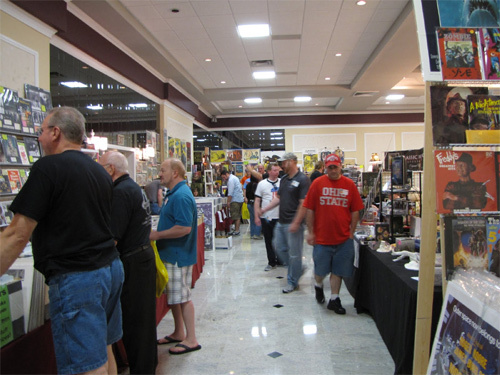 The Creepy Classics Room at Monster Bash 2012. 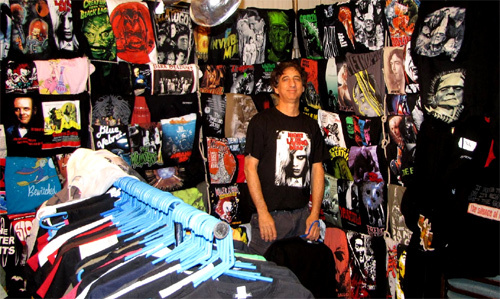 A shirt for every monster fan - it's Steve "The T-Shirt Guy" Unger. 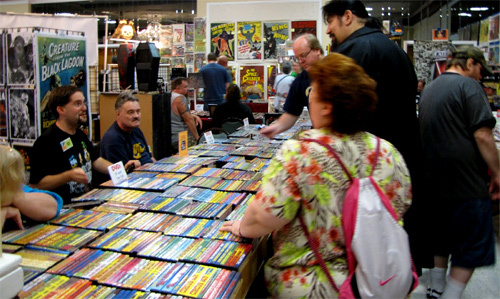 Martin Grams with truckload of rare DVDs. 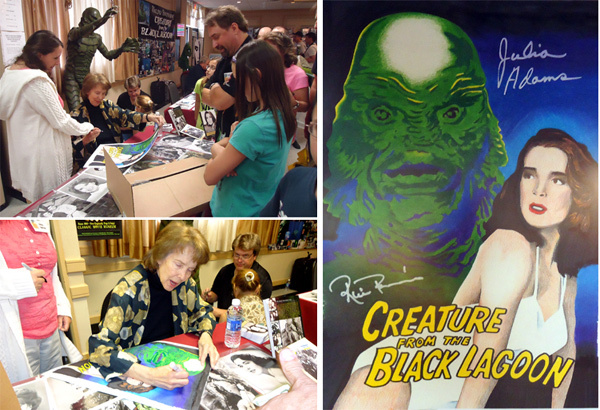 Julie Adams signs autographs for fans at Monster Bash..iIncluding this original art by John Sargent! Another great shot of the Bash Boys and special guests after their performance Friday night!